First off, if the inventors catch you calling it a hang drum, they won’t be too pleased. They insist that the name of the instrument is a “hang”. Here, though, you’re allowed to call it a hang drum. We won’t tell, if you don’t. Anyway, you’re here for a hang drum because you’re looking to create some beautiful music. And we’ve got you, friend. Like we always do. Choosing the best hang drum can be a bit tricky especially because it’s not a native instrument. You do know it’s of Swiss descent, right? Sure, you do. But don’t worry, we have all the details plus detailed reviews on our five favorite hang drums. And yeah, we are willing to share. We love love this hang drum made by HAPI. It’s adorable and darling in size and looks to be of superior quality. It’s got this lovely coppery shine to it. So, it’s beautiful to look at too. It makes a fantastic meditation companion. And its beautiful, soothing sound is just what you need to calm down after a long day. For sure, those suffering from depression will also enjoy using this drum to relax. That said, the drum does produce beautiful sound, for the most part. However, there are still one or two occasions when one of the tongues fails to behave, if you know what we mean. One or two of the tones do tend to go off. We don’t know why that is, though. And then again, this isn’t a tunable drum. So, you can’t really correct that. But then again, overall, the sound is pretty good. So, maybe one off tune might not be so bad. This drum comes with two cute little rubber mallets. 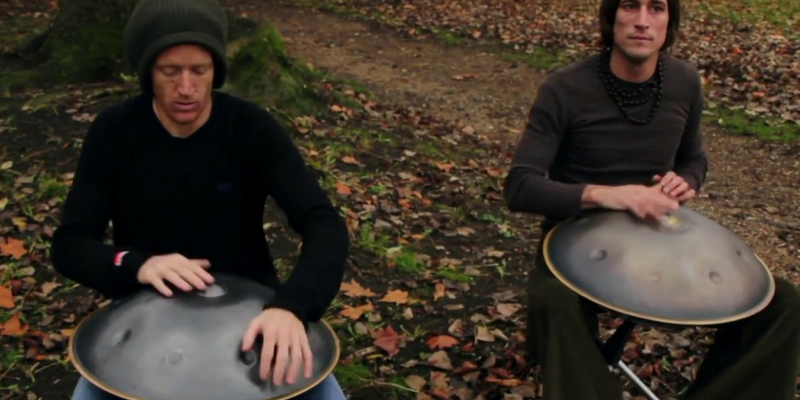 Now, if you’re a hang drum purist, and would rather play with your fingers, that’s fine too. However, some people seem to be of the opinion that the mallets produce a better sound than the fingers. Our opinion? Does it matter? You know what’s soothing for you. And it’s a good thing you have both – fingers and mallets. You can try both and decide! Comes with a carrying case to make lugging easier. One or two off tunes. Size is a little too small for some folks to balance on their laps. Okay this hang drum is quite on the pricey side. But it looks so well made and beautiful that we’re willing to forgive its extravagance. Plus, it is also made by hand. A beautiful, hand-forged instrument? We want! In fact, here’s the best part of this hang drum and another reason it’s totally worth the price. It only starts getting built when you order for it! Talk about custom made! You get to choose your own scale. And then the manufacturers take about two weeks to build a stunning instrument that’s made just for you. Surely you can’t compare the expected output to a hang drum that’s mass produced (no offence to other drums). As to the sound, of course, you can expect nothing else. An instrument that’s so intricately forged has to give impeccable sound, shouldn’t it? And this one does. Although, it might cost a lot but rest assured it’s worth every cent. Not a single off tune at all. It also comes with a carrying case. So, if you plan to take your drum along with you for your next yoga session, you’re covered. Nothing will happen to your precious (pricey) baby in its soft, carrying case. This particular hang drum doesn’t come with playing mallets, though. However, it doesn’t even need them. 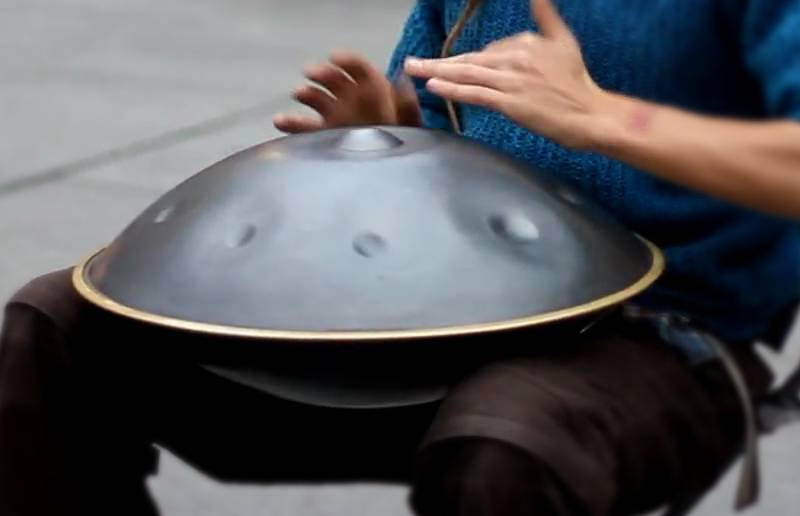 Your fingers are enough to produce those magical, compelling notes from your hang drum. Excellent drum materials for durability. Comes with soft carrying case. Here’s another really beautiful hang drum. The details and embellishments on the drum are really attractive. Trust us, it’s something you’d have no problem whatsoever hanging as a decorative piece in your home. It’s that beautiful. But hey, we’re not here for its beauty, are we? Although that’s an added advantage, the sound is even more beautiful. Apparently, Shamanicshop uses patented technology to make sure that this hang drum only produces the most incredible sound. Also, the drum is fine tuned already. So, you shouldn’t experience any off tune whatsoever. We also appreciate the fact that Shamanicshop makes this drum with a stand. There’s this rubberized flip skirt that the makers include with the drum. This way, you can easily balance the drum on the floor and play. So, that gives you two convenient ways to play to your heart’s content – on your laps or on the floor. Finally, it comes with a sweet carrying case. And the case comes as a back pack so you can conveniently lug it on your back to wherever you’re going. With rubberized stand for playing on the ground. First off, if you thought that hang drums could only come in monotone metallic colors, then you’re wrong. At least, Crystal Energy Bowls has proved you wrong. Hang drums can come in really exciting colors… just like this one we’re reviewing! This particular drum comes in a ravishing purple shade. However, there’s more where that one came from. 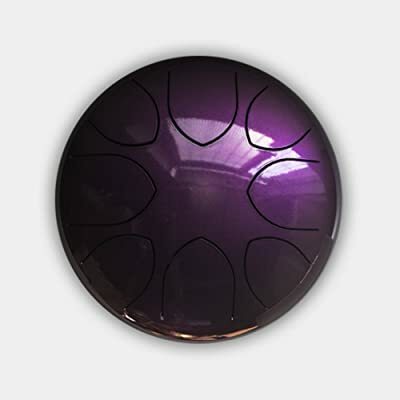 This purple drum has several other siblings, each in their own unique, amazing color ranging from green to red, to pearl to white. The sound of this drum is ethereal and amazing. You can decide to play it with your hands. Or if you prefer, there are also some soft rubber mallets included. Any way you decide to go, rest assured, you’ll get a beautiful tune. Always. It comes with its own carrying case to make lugging around a bit more convenient. It also protects your beautiful drum from scratches and what not. Altogether, this is one hot number that we totally love. Comes in many attractive color options. Come with carrying case and rubber mallets. Actual product might differ a little in color from what’s displayed. We love the compactness of the Pyle drum and how it makes this drum a great companion for any kind of purpose. Whether you’re going recording or you just need something to play in your spare time, this fits right in. It also comes with a nice weight that’s light enough so you can carry it on the laps without developing cramps. And it’s not just for play, this drum is also easy to carry around. There’s a carrying case, of course. But then, it’s not heavy to move around either. We love the soothing sound of this drum. All tunes are correct and on point. And at this really affordable price, we are glad that you can get such value. As with a normal hang drum, the learning curve of this drum is really easy. A lot easier than learning to play a uke, that’s for sure. Professional musicians and novices alike will enjoy playing this instrument. Lastly, it comes with rubber mallets, so feel free to use them as you please. Or if you’d prefer, you can also go the traditional way and use your fingers. The only rule is that you have a relaxing, enjoyable time with your drum! Might be too small for some folks. Like we mentioned in the introduction, a hang drum or hang is a Swiss instrument. In direct translation, “hang” means “hand” in the Bernese German language. Probably the reason everyone calls it a hang drum much to the inventors’ combinative chagrin. Today, we are going to be telling you a bit more about a hang drum. So, are you ready for an educative time? Cos we are. What Really Is The Hang Drum? The hang drum is a Swiss instrument meant to be played with the fingers and the hands. 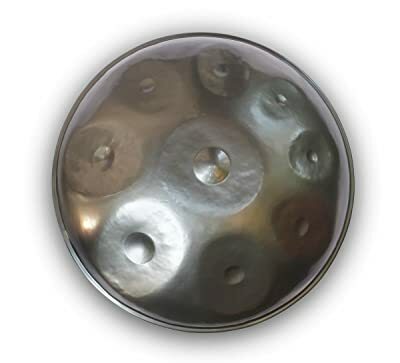 And it is very similar to the native Steeldrum of Trinidad. While many consider this instrument to be a drum, it really isn’t. In fact, if hit too strongly, the hang drum can lose its tune very easily. So, you see, calling it a percussion instrument might be a bit of a stretch. The bottom part, on the other hand, is known as the “Gu” side. And, normally, you’re supposed to play the Gu side about the same way you’d play a Ghatam drum or an Udu. But it’s not our focus today. Now, one point to help you get the best from the hang drum… If you want to get the characteristic warm sound the hang drum is known for, you must play the hang drum very lightly. Preferably, play with your fingers. The hang drum comes with a central note. And this central note is referred to as the “Ding”. Then from this “ding” comes about 7 (could be 8 too) tones circles surrounding it. However, the tunings weren’t always this few. The first time the hang drum was created, it came with many tunings – up to 45 tunings. At that time, the choice of these different tunings was inspired by different historical and ethnic scales. However, based on use and feedback over time, the designers had to reduce the number of tunings. This, consequently, caused a decrease in the tonal range of the hang drum altogether. So, what you have these days is the central note (called the Ding) at D3. And from this note come 7 other notes surrounding the ding like we explained earlier. These 7 notes are A3, Bb3 (yeah, you read right “Bb”), C4, D4, E4, F4, and A4. Who Is The Hang Drum For? Well, if you think you need professional training to play the hang drum, you’re very wrong. According to Rohner and Scharer, the inventors of the hang drum didn’t design it with a professional musician in mind. You’ll find this in a statement they made after the production of the integral hang drum. This statement was published in the “Letter from the Hangbauhaus”. The inventors of the hang drum and owners of PANart (the company that made the first hang drums) stated, in that letter, that their hang drum unlocks intimacy and freedom. They also advise that players of the hang drum play without feeling the pressure of modern music (with the need to study and practice and all). So, in other words, the hang drum completely eliminates the need to study and practice as you have with other instruments. Just a carefree release of beautiful music. Don’t you just love that?! Shout to Rohner and Scharer for giving us one less thing to study for! 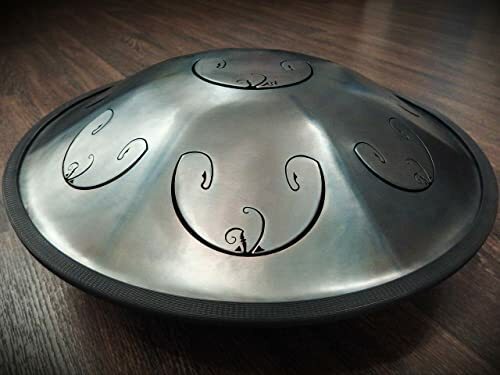 The hang drum has certainly evolved from its first introduction in the early 2000s. 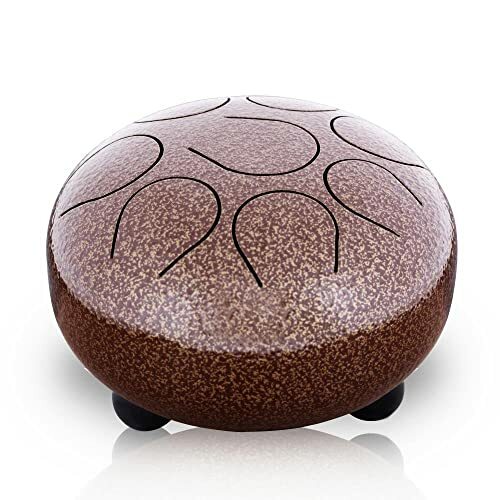 These days, people use the hang drum (sometimes also called the tongue drum) to facilitate relaxation during yoga and other meditative exercises. Also, contrary to the original intention of the inventors, more people tend to use soft rubber mallets instead of the hands. Plus, you find all kinds of scales also available as well. in fact, some manufacturers allow you to choose your own scale. Pretty cool, yeah? All in all, the hang drum is still a darling instrument used by different groups of people around the world. So, who wins today on our reviews for the best hang drum? 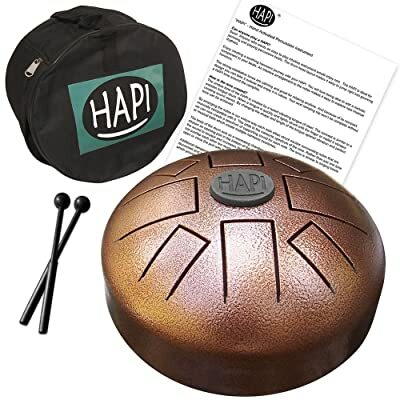 We will give it to the HAPI HDMINIDAKE 8inch Tongue Drum. It’s the perfect size for a hang drum and plays really nicely too. It’s relatively affordable. Plus, it appears to be a customer favorite. That has to mean something! PS: Our next option would be the Bali Steel Pan. It costs a pretty penny but then you’d be getting your every penny’s worth. Plus, the manufacturers will customize the drum’s scale to your exact specifications. So, want to give it a try?